Shea Butter is one of my favorite natural beauty products so I was thrilled when Bella Lucce contacted me to review their Tamanu Whipped Shea Butter. 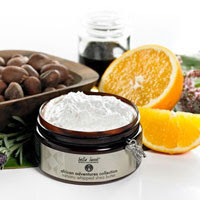 Bella Luccè has created their unique collection of globally-inspired, naturally focused skincare products incorporating some of the world’s most exotic ingredients. Featured in luxury spas, salons and wellness centers from Los Angeles all the way to Dubai, Bella Luccè has found a home in more than 700 select locations worldwide. These luxury products have been featured in Allure, US Weekly, Vegetarian Times, Body + Soul, Southern Living, Organic Spa, Life & Style, as well as dozens of magazines across Europe and the Middle East! Here is my review. This luxury shea butter is whipped with 85% pure shea butter and infused it with Tamanu oil and a dose of yangu seed oil (whose seeds are believed by African Xhosa warriors to hold magical powers)! It is magical and you'll see once it soaks into the skin. It's also an excellent belly balm for expectant moms, a sunburn soother, a dry skin slayer and you can even add whatever's left over to calm frizzies and fly aways. Pure shea butter also works wonders to treat scars and stretch marks! This body butter really moisturized my dry winter skin and left a glowing sheen on my skin. I'm loving my smooth, hydrated skin and I think you will too! To get yours and browse their luxury bath and body products, please visit hhttp://www.bellalucce.com/.